My little baby spider Ella has finally found a home on my Halloween wreath. For some time now I have been wanting to make a yarn wrapped wreath. I've eyeballed quite a few on etsy (here) so this past week, while at Michaels, I spotted the perfect pumpkin colored yarn for a fall wreath. I purchased the yarn along with a charcoal gray skein and a straw wreath. I believe the wreath was under $5.00, which was cheaper than the foam wreaths. Rather than unwrapping the plastic covering around the wreath and having a straw mess on my floor, I left the plastic on and wrapped the yarn over it (per my moms suggestion). The bunting banner is made out of a paper grocery bag I had on hand. I think I got the idea from a Martha Stewart craft but I'm not entirely sure. Anywho, I cut the paper to a letter size and ran it through my printer. I created the BOO! template in illustrator and saved it as a pdf. 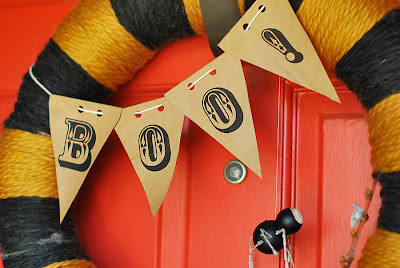 Below is the link to the Halloween bunting pdf I used. Feel free to bunt away. The pdf includes the words BOO! and Happy Halloween. 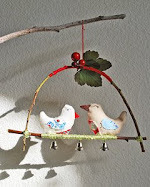 I did a craft project with a straw wreath years ago and took the plastic off. BIG MISTAKE! oh wow! really cool idea! Saw this today and had to make it! It was so easy, and my kids love it. Thanks so much for the great idea! I'll be making a yarn wreath for Thanksgiving and Christmas now, too. Love that wreath! What a great use for your wonderful spider, too. I've been wanting to try a yarn wreath for awhile now - this might be the push I need. Thanks for the inspiration! Dearest sweet Jamie, i am loving this wreath! That bunting banner is awesome...thanks so much for sharing! Soo inspiring! Have a lovely merry happy week and love to you! 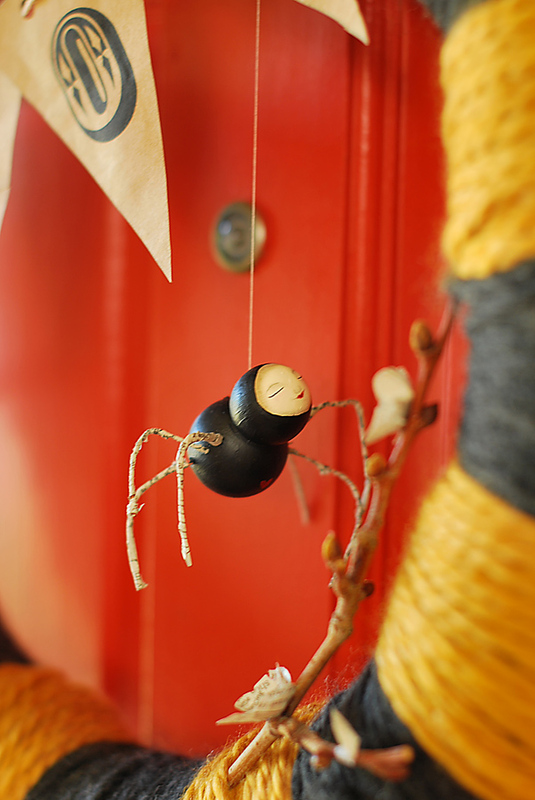 I'm not usually one for Halloween or the decorations but I think this is adorable. I sooooo love the spider Ella, and your patterns! Clothing designer here! I was so inspired by your blog and just couldn't leave without telling you...Plus, my name is Kristina, too =) Can't wait to see what comes next! It was the most happy helloween for me! LOVE! 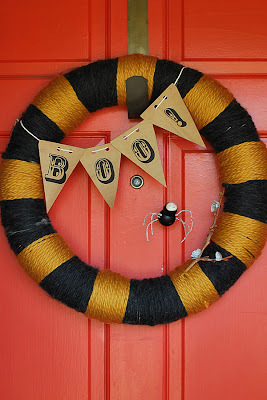 I just did a blog post about Halloween wreaths and featured this beauty! I am sure I will be making this soon and will post my results. I saw so much useful data in this post! Made this with my daughter yesterday! We love it! I made this with my kids this week, they loved making it and it looks great! Did you wrap it first with all black then add the orange sections? I love your wreath, it is fabulously creepy. Thank you for sharing!